2017 Expedition conquers fjords, glaciers and off-road adventure in the Alaskan off-season. Alaska! I am consumed with excitement as I arrive in Anchorage and see the stunning wilderness stretching out all around me and my adventure-loving friend Chandler. To us, this state—where bush planes dot the sky and sled dogs are still a viable transportation option—truly is the last frontier, filled with possibilities. More than 60 reality shows have been filmed here, including Deadliest Catch and Yukon Men, because it’s just so raw. This is the ideal place to experience the powerful, capable 2017 Expedition King Ranch®, with its responsive 3.5L EcoBoost® engine and available Control Trac® 4-Wheel-Drive System. 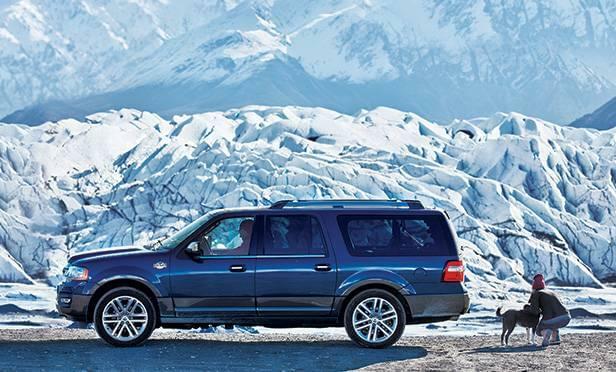 The Expedition is always prepared to tackle the most challenging road conditions. 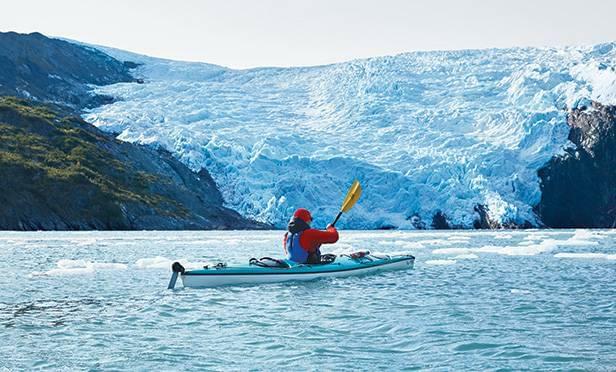 Alaska may be busiest in the summer when the daytime temperature hovers around 65 degrees—but to many explorers it is most fun when a frosty nip is in the air and a sparkly layer of snow coats the breathtaking landscape. Chandler and I load our cold-weather adventure gear into the spacious vehicle with enormous smiles on our faces, eager for the Expedition to transport us through Alaska’s majestic untamed wilderness at the state’s wintery best. Our first mission: to go kayaking in Alaska’s Prince William Sound, where ice-bound mountains jut dramatically out of the sea. Chandler and I are up before sunrise to drive southeast along Alaska Route 1, heading for the port town of Whittier. Before long, we enter Anton Anderson Memorial Tunnel—a 2.5-mile modern marvel originally built for the Alaska Railroad and now the longest combined rail and highway tunnel in North America. The curved ceilings are cathedral-high, yet the walls are mostly jagged rock, as if the engineers just finished blasting through. We secure kayaks onto the roof of the Expedition, thankful for the power-deployable running boards that give us easy access to the roof racks. 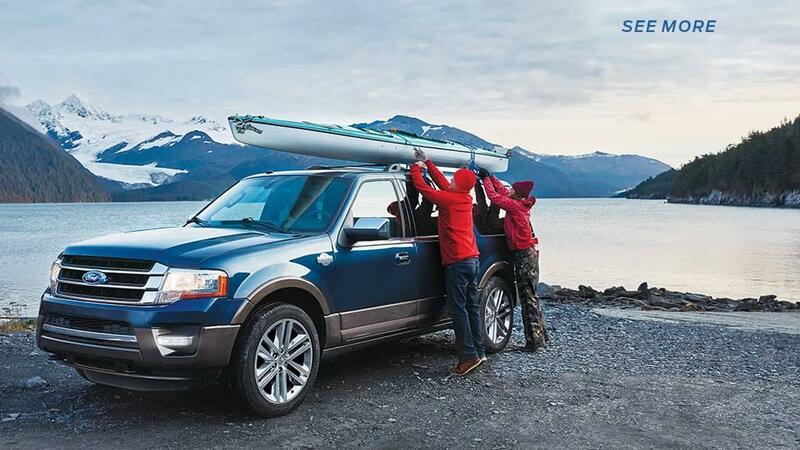 And we are delighted when, with the touch of a button, the PowerFold® third-row seats* fold flat to create plenty of cargo room to hold our paddles and bags of gear for our drive to the docks. At the waterfront, Bender’s crew unloads the kayaks onto the Qayaq Chief, a 40-foot landing vessel, then we set off on the exhilarating 40-minute boat trip to Blackstone Bay. Approaching the bay, Chandler and I are amazed by the massive ice floes and magnificent fjords—long, narrow, deep inlets between high cliffs, some with thin waterfalls cascading into the sea. The crew shows us how to operate the fiberglass sea kayaks; the type we’re paddling out in today have rudders controlled by pedals under our feet. Then we drop our rides into the bay and glide along in perfect quiet. We ogle the glaciers rising from the water as fish flit by in the depths below. The off-season is still a fine time to catch a glimpse of marine life in Alaska, says Bender: “Some humpbacks don’t migrate, especially immature ones. The orcas come and go, and we almost always see otters and seals.” Right as he finishes speaking, an eagle suddenly appears and soars straight over the boat. As I reach out and touch a floating “growler” of ice, then get close enough to a fjord to catch a stray drop of falling water, I wonder how it felt for the Chugach Sugpiaq people, who hunted these waters in traditional wooden kayaks. This place somehow feels prehistoric and modern at the same time—it’s impossible not to fall in love with the splendor. Our next adventure: glacier hiking. From Anchorage, we head northeast on Alaska Route 1 toward the mighty Matanuska Glacier, which is 27 miles long and four miles wide at its terminus. The two and a half hour drive winds between two snow-covered mountain ranges—the Chugach to the south and the Talkeetna to the north—which means amazing views from the comfort of our leather-trimmed, heated seats. As the road climbs higher, the Expedition’s 365-horsepower** EcoBoost® engine effortlessly powers through even the steepest stretches. Sheehan shows us how to lean forward as we walk uphill to help the spikes sink into the ice and get a solid grip. Chandler and I take our first cautious steps, then happily scramble across the glacier’s open expanse. Sheehan leads us to a mind-boggling ice bridge with water flowing underneath. On every new vista are new ice formations, some resembling breaking waves or outstretched wings. The glacier’s formations are like clouds that look different to every set of eyes. “This glacier is around 20,000 years old,” says Sheehan. “And you’re not even seeing 10 percent of it—this is just the edge. Pretty incredible, isn’t it?” Chandler and I nod, eyes wide. Incredible is right. 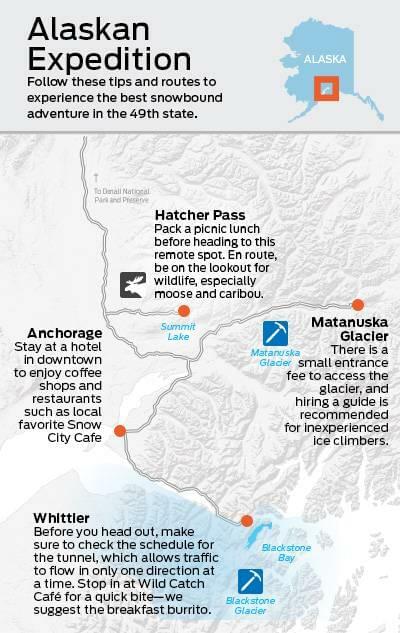 Our winter excursion today involves off-roading in the rugged Alaskan wilderness, then hiking up to Hatcher Pass, a gorgeous high-altitude area in the Talkeetna range. Our guide? Destry Smith, a bearded, self-described “jack of all trades,” with a lifelong passion for the outdoors. “When I can’t see mountains or water, I get uncomfortable,” Smith says with a laugh. The peaks are definitely visible as we head off the road on a shortcut Smith recommends. Thrilled, I flip the Expedition’s continuously controlled damping system* to Sport mode to automatically adjust the suspension for off-road handling, then we effortlessly cut across a wide, shallow stream,|| before reaching Willow-Fishhook Road—a main route to Hatcher Pass. Up ahead we see some steep downhill turns, so I’m grateful for Hill Descent Control™, which enables the braking system to automatically engage, allowing me to focus on driving and search for hidden danger zones like rocks and divots. After a sharp curve, the valley opens up in front of us revealing an awe-inducing string of snow-covered mountains. “There’s a history of gold mining here,” says Smith as he points out a wood cabin that’s part of an old claim site. I look around and consider all the white, icy gold the mountains and skies have already offered up for us on this trip—and I am completely humbled. When the Expedition smoothly reaches Hatcher Pass, the snow is easily three feet deep. Chandler and I lace up our boots and hike to a high rocky perch for a panoramic view of the unbridled terrain around us. The entire wilderness shimmers below us, stretching out in every direction, revealing a sublime, breathtaking beauty. Now this is the Alaska I’d dreamed about. *Available Feature. **Horsepower ratings achieved with 93-octane fuel. †Torque rating achieved with 93-octane fuel. ‡Class is Extended Utilities based on Ford segmentation. §Don’t drive while distracted. Use voice operated systems when possible; don’t use handheld devices while driving. Apple CarPlay is available on 2017 models with SYNC 3; owners of 2016 models with SYNC 3 are required to perform a software update, available early 2017, and purchase a hardware upgrade through your dealer. Requires phone with compatible version of Apple iOS and active data service. SYNC does not control Apple CarPlay while in use. Apple is solely responsible for their functionality. Message and data rates may apply. Apple, Apple CarPlay, iPhone, Apple Maps, and Siri are trademarks of Apple Inc. ||Try to avoid water higher than the bottom of the hubs and proceed slowly. Refer to your owner’s manual for more detailed information regarding driving through water.